Nearly every cosmetologist, barber, nail specialist, or facial specialist dreams about opening their own salon or barbershop. Opening a salon or barbershop is an exciting adventure! But before you set your sandwich board out on the sidewalk announcing your grand opening and get your product display shelf just right—you have some paperwork to complete. This means sending in applications, preparing for inspections, and reading over the Florida laws and rules to make sure your space meets all the requirements. No one wants their salon or barbershop to be cited during an inspection. This article isn’t about how much of your space should be devoted to organic retail or how to create a cool and calming atmosphere. The Board isn’t concerned about your pricing, cute business cards, online scheduling portal, or the size of your retail space. The board is concerned with ensuring the safety of the public in Florida. This needs to be a large part of your planning, not just an afterthought. If you have a lot of questions or do not know where to begin with your official paperwork, that’s understandable! Opening a salon is a huge undertaking, and we want to make this whole process easier for you. Here are some of the most frequently asked questions along with their applicable Florida Statute or Board Rule. We also have included links to applications and a few tips to help you move forward with your business dream. I already have a (cosmetologist, nail specialist, facial specialist, or full specialist) professional license or registration; do I also need a salon license? Yes. 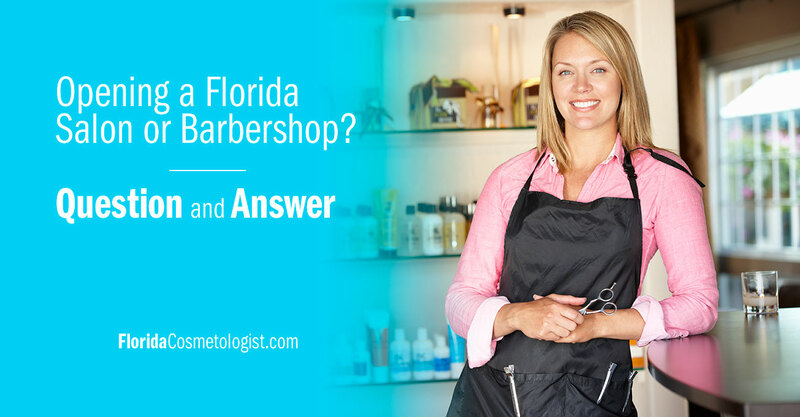 The Florida Board of Cosmetology licenses and regulates cosmetologists, nail specialists, facial specialists, full specialists, hair braiders, hair wrappers, body wrappers, cosmetology salons, and mobile cosmetology salons. Florida requires a salon license for any location where cosmetology or a specialty (nail, facial, full specialists) is practiced. Again, the purpose is to make sure the public in Florida has access to salon services in a safe and sanitary environment. Operating a salon or barbershop without a license is considered unlicensed activity. Unlicensed activity in Florida is a criminal offense and can result in misdemeanor or felony charges if an individual is convicted. Salon” means any establishment or place of business wherein cosmetology as defined in Section 477.013(4), F.S., or any specialty as defined in Section 477.013(6), F.S., is practiced for cosmetology in a licensed barbershop, or the practice of barbering in a licensed cosmetology salon, provided the salon employs a licensed cosmetologist. Except as provided in Rule 61G5-20.010, F.A.C., a salon must be at a fixed location. I only do nails and facials do I need a salon license if I do not do hair? Yes. Services from nail, facial, and full specialists are considered specialties under Section 477.013(6), F.S. These services are required to be carried on in a salon or specialty salon. (1) No cosmetology salon or specialty salon shall be permitted to operate without a license issued by the department except as provided in subsection (11). (8) “Specialty salon” means any place of business wherein the practice of one or all of the specialties as defined in subsection (6) are engaged in or carried on. (6) “Specialty” means the practice of one or more of the following: (a) Manicuring, or the cutting, polishing, tinting, coloring, cleansing, adding, or extending of the nails, and massaging of the hands. This term includes any procedure or process for the affixing of artificial nails, except those nails which may be applied solely by use of a simple adhesive. (b) Pedicuring, or the shaping, polishing, tinting, or cleansing of the nails of the feet, and massaging or beautifying of the feet. (c) Facials, or the massaging or treating of the face or scalp with oils, creams, lotions, or other preparations, and skin care services. I want to go to my client’s location; do I need a salon license? Mobile salons are also licensed in Florida. If you plan to open one, mobile salons are subject to similar rules as salons, including periodic inspections. (10)(a) The board shall adopt rules governing the licensure, operation, and inspection of mobile cosmetology salons, including their facilities, personnel, and safety and sanitary requirements. (b) Each mobile salon must comply with all licensure and operating requirements specified in this chapter or chapter 455 or rules of the board or department that apply to cosmetology salons at fixed locations, except to the extent that such requirements conflict with this subsection or rules adopted pursuant to this subsection. Are there any other exceptions for needing a salon license? Yes, but just a few. They include going to a nursing home, hospital, or residence when a client is unable to make it to a licensed salon for reasons of ill health. There are also exceptions if the salon service is part of a motion picture shooting on location, trade show demonstration, or educational seminar. (2) Pursuant to rules established by the board, cosmetology services may be performed by a licensed cosmetologist in a location other than a licensed salon, including, but not limited to, a nursing home, hospital, or residence, when a client for reasons of ill health is unable to go to a licensed salon. Arrangements for the performance of such cosmetology services in a location other than a licensed salon shall be made only through a licensed salon. (3) Any person who holds a valid cosmetology license in any state or who is authorized to practice cosmetology in any country, territory, or jurisdiction of the United States may perform cosmetology services in a location other than a licensed salon when such services are performed in connection with the motion picture, fashion photography, theatrical, or television industry; a photography studio salon; a manufacturer trade show demonstration; or an educational seminar. Do hair braiders need a salon license? (2) Hair braiding, hair wrapping, and body wrapping are not required to be practiced in a cosmetology salon or specialty salon. When hair braiding, hair wrapping, or body wrapping are practiced outside a cosmetology salon or specialty salon, disposable implements must be used, or all implements must be sanitized in a disinfectant approved for hospital use or approved by the federal Environmental Protection Agency. Can you have both a barbershop license and a salon license? Are barbershops also regulated by the cosmetology board? No. The Florida Barbers’ Board regulates barbers, restricted barbers, barber assistants, and barbershops. Does a licensed barber also need a barbershop license? Yes. Just like the cosmetology board, licensed barbers are required to work in a licensed barbershop. They also are inspected after a barbershop is licensed. “Barbershop” means any place of business wherein the practice of barbering is carried on; however this does not prevent the practice of barbering in a licensed cosmetology salon or the practice of cosmetology in a licensed barbershop, provided the barbershop employs a licensed barber. When can I open my salon or barbershop? Do I need to wait until after the inspection? No, but you must wait for the license to be issued so it can be posted/displayed. After the license has been issued, an inspector will visit your shop unannounced within 90 days for the initial inspection. Inspections are designed to keep the public safe, so the focus will be on sanitation. Inspectors will be looking for the minimum size of the salon, the presence of MMA, display of licenses, and maintenance/cleaning records of certain equipment. If something needs to be addressed, they will typically let you know about it right away so it can be corrected quickly. The paper applications for salons and barbershops have a list of items the inspector will be auditing during their visit. For a complete list of safety and sanitary requirements for salons, please refer to Rule 61G5-20.002, Florida Administrative Code. For a complete list of safety and sanitary requirements for barbershops, please refer to Rule 61G3-19.011, Florida Administrative Code. How much is the application and renewal fees for a salon or barbershop? Initial Salon Application: $40.00, plus a non-refundable application fee of $50.00. Salon Renewal Fees: $40.00 paid on or before November 30th biennially (even-numbered years). Initial Barbershop Application: The application fee is $130 (includes inspection). Barbershop Renewal Fees: $110.00 paid on or before November 30th biennially (even-numbered years). I want to have a salon in my home. Is that legal? It is legal and is handled like any other salon but with a few additional requirements, outlined below. Also, you should be aware of additional zoning regulations that may exist and may prohibit you from conducting business in your home. Check with your city or county government offices. 3. A salon, or specialty salon may be located at a place of residence. Salon facilities must be separated from the living quarters by a permanent wall construction. A separate entrance shall be provided to allow entry to the salon other than from the living quarters. Toilet and lavatory facilities shall comply with subparagraph (c)2. above and shall have an entrance from the salon other than the living quarters. 4. Animals: no animals or pets shall be allowed in a salon, with the exception of service animals and fish kept in closed aquariums. I want to have a massage therapist rent a room in my salon or barbershop; is there anything additional required for that? Yes! The Board of Massage is under a different department than the Cosmetology and Barber Boards. The Florida Department of Health, not the Department of Professional Business Regulation, oversees massage therapists and massage establishments. Requirements for a massage establishment license include an application and fee of $255. It also requires a separate inspection and background check (with fingerprinting) for the owner of the license. The owner is also required to maintain property damage and bodily injury liability insurance coverage on the massage establishment. You can have the massage therapist own the establishment license. If they leave the establishment, the license goes with them. The renewal fee for massage establishments is $155 and is due every other year by August 31st. Do I need any other permits or licenses? Probably. Numerous permits are required before opening a salon. Other permits and licenses may include a business operation license, a certificate of occupancy, a license to sell retail, a fire department permit, and a state cosmetology license. Contact your local municipality to see if anything else is required for opening a new business. Additionally, you must choose a business structure for your salon, such as a partnership or corporation. We recommend that you meet with an attorney, who can explain tax and legal ramifications that will help you decide. You can either go to work, or you can be the boss. You’ve been dreaming about owning your own space and the flexibility and autonomy it brings. This information is all part of this dream of yours. Enjoy the new adventure! Do you have any other questions? If so, let us know and we would be happy to help you find the answer. Do you, yourself, have to hold a cosmetology or barbers license to hold the salon or Barbershop business license? Can I open the business and have only licensed professionals work there? No. Anyone can hold a barber or salon license – you just cannot offer the services without the barber or cosmo licenses. Previous Post: « Barber vs Cosmetologist: What Is the Difference?